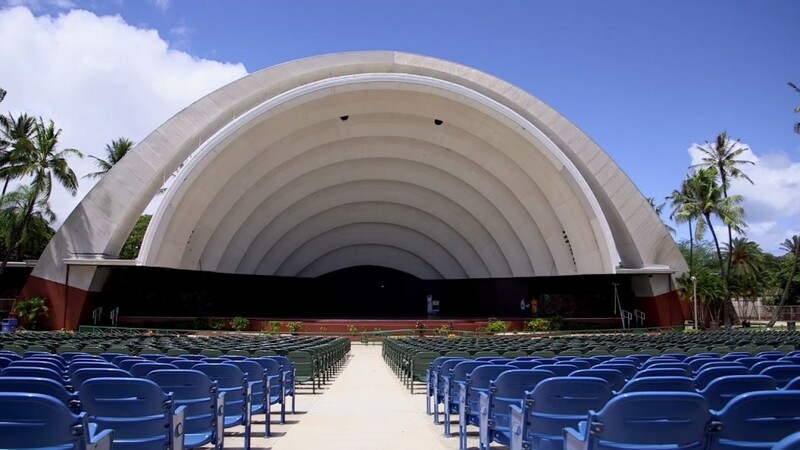 With world-famous Diamond Head for a backdrop and Waikiki Beach just across the street, the Waikiki Shell is a unique venue for outdoor concerts and other large gatherings. This magnificent shell-shaped facility – with its acoustically sophisticated stage, is an ideal location for twilight concerts, featuring balmy skies, lush greenery and of course – the Entertainment. You’ll find no other setting like this in the world! The large stage, convenient work areas, dressing rooms, professional lighting, sound equipment and the unique setting, makes the “Shell” a most desirable facility in which to present an event. There is seating for 1958 on stadium chairs, an additional 6,000 on the lawns and a front “pool” area which seats 505 theater style or 320 at banquet tables. • No coolers, outside food & drinks allowed. • No packages, bags, knapsacks and backpacks allowed. • Any outside alcoholic beverage will be confiscated. Any patron under the age of 21 found drinking will be subject to ejection and/or arrest.